Today's snack bento was quick to prepare. I woke up late because I forgot to set up the alarm clock last night. I thought I turned it on already but ... oh well! I was racing with the time and managed to make pita bread sandwiches filled with chicken patties, lettuce, tomato, and mayo. Put some strawberries and grapes, a quarter of sweet orange inside the sandwich box and decorated it with cheese boy on the top of pita bread sandwiches. I used wax paper inside the sandwich box to keep the foods clean. I love this sandwich box because it can be folded, so it is easy to use and store. I have some folded sandwich boxes with cute characters on the lid that I got them a couple months ago. I was in hurry to take the picture and forgot to take the picture on the lid of this box. But it was Lightning McQueen from Disney-Cars movie. You are such a great mum, still preparing such a cutey bento for your child even in a short time. Not sure if i can wake up early for bento-ing after my child get into school.. haha..
Congrats Lia. Your kids are so lucky to have such a great MUM. The cheese boy looks cute! Good looking quick lunch! It looks very tasty. Hi Lia! Happy to see you get to use the cool sandwich box. Esp with bento addicts, it's important to fold down to save space, eh? LOVE the pita idea, so fresh and delicious-looking! Congratulations in the contest, I am not surprised you finished so well, your talents are so exquisite! 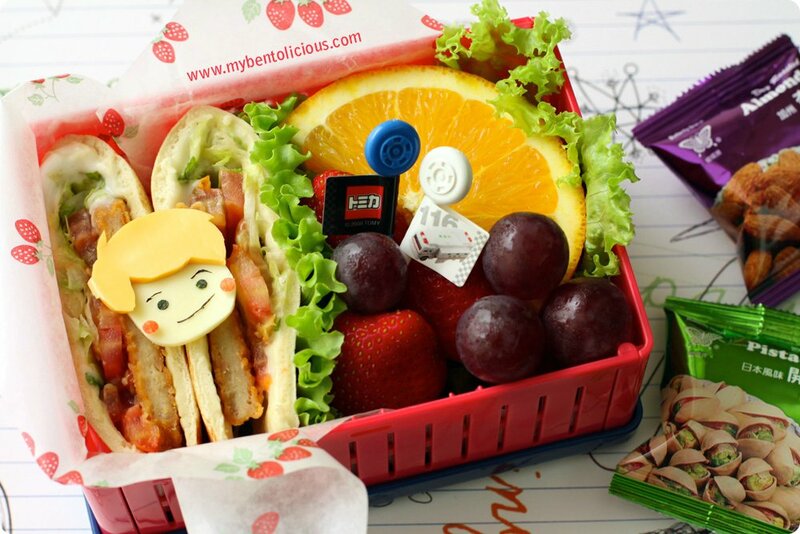 What an adorable and tasty looking bento! I can't believe it is a rushed one! Congrats on your lovely spring fairy being 2nd place! Well done! You never fail to make nice bento even if you are in a hurry, salute! @sherimiya : Thanks a lot Sheri for your kind comment! Thanks to let me a lot from you. And I agree with you about spacing ... a folded box like this saves a lot of space indeed. So cute! I love the little boy! :D Even your quick bentos are wonderful! even in rush you still can prepare such beautiful + wonderful bento ^_^ love it very much and congratulation too! @仪仪妈咪 : Thanks a lot for your kind comment! Congrates Lia, all your bento is impressive! I strongly agree with Kids Dream Work, you never fail to make nice bento even if in a hurry. Congrats Lia for the 2nd Place. For me, your fairy is a #1. For someone in a hurry, your bento looks like well prepared.. Your speedy bentos are awesome bentos! Wow. Congratulations on your recognition as one of the top 10 bentos in THE WORLD! How cool is that? Your bento definitely deserve to win!! In fact all your bentos are so beautifully done! @mushima hawani : Thanks a lot Wani! You have been a great supporter all along. Really appreciate it! On one of my better days I might be able to produce what you seem to able to come up with in a heartbeat. :-) Lovely in presentation and in taste. Congratulations on being the runner-up in this global contest, I hope you'll enjoy your prize.